Hydroculture is a relatively new name for an old practice of growing plants in containers filled with water and aggregate to which soluble plant foods are added. In place of soil, plants are held in position by the aggregate. The beauty of a water garden is that the plants need very little attention. Other advantages include vigorous and healthy growth, and freedom from soil-borne disease and pests. It is best to use plants that have already roots in water before putting them into the new medium, since the roots made in water are quite different from those made in soil. 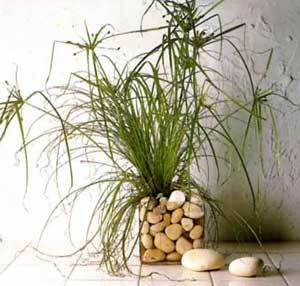 "Prepared" plants can be bought, or you can use cuttings of soft-stemmed plants that have been rooted in water. The basic materials for Hydroculture are the aggregate, usually packed in plastic bags, and the container, which may be used on its own or have a liner. The aggregate must be clean and inert and tan be grit, pea-gravel, perlite ore, more commonly, a purpose-made granule composed of expanded clay. One name given to a particular aggregate is hydroleca - "hydro" meaning water, and "leca" standing for "lightweight expanded clay aggregate". This consists of lightweight pellets of varying sizes and fairly random shape that have been fired in a rotary kiln. As a result, most of the clay has been forced to the outside wall of the pellet, leaving a honeycombed center. The great advantage of the pellets is that their outside cases conduct water from the bottom of the container, thus moistening all the pellets. There are two main types of container that can be used - the single container and the double container. The single container may be made of any kind of watertight material (other than untreated metal that would affect the chemicals put into the water and would probably rust), ideally with a broad base to give stability. Glass is a probably the best material to use. Apart from looking attractive, a glass container allows you to keep a check on the water level and the amount of roots in the container. The double container has a similar watertight outer container into which fits a smaller container. The small container hangs on the rim of the larger container and holds the aggregate and plant. The inner container is usually made of plastic and has holes or slits in its sides and base to allow air and water to circulate around the pellets and the plant's roots. In both cases, the water should only be in the lower regions, never in the upper ones. With the single container, the bottom quarter or third of the aggregate should be submerged; with the double container, it is normally enough that the inner container, filled with the aggregate, be in direct contact with the reservoir of water. A water gauge will indicate when more water is needed. To feed plants grown in hydroculture, fertilizer is put into the water. The simplest way is to use a standard liquid fertilizer in the water used for filling the reservoir. The danger with this method is that nutrients which are not used immediately by the plants tend to crystallize out of the liquid on to the pellets and roots of the plant, and should really be washed out of the base periodically, which can be messy. It is much simpler to use a specially designed hydroculture fertilizer bonded into a pad or disc, or packed in a sachet which is placed in the water. The advantage of these pads or discs is that they do not release multi-chemical fertilizer all the time, but only when the water lacks the particular element, and so no harmful build-up of chemicals is possible. 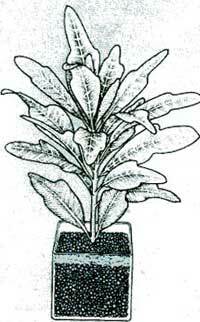 Cuttings from soft-stemmed plants are suitable for rooting in water. When the cuttings have made roots in water, they can be planted in hydroculture containers in much the same way as cuttings are planted in potting mixture. Hold the cuttings upright and carefully trickle the aggregate around the roots, then tap the container gently to settle the aggregate. Never bury the cuttings deeper than you would if planting them in potting mixture, and shade the planted cuttings for a few days until they have settled down in their new home. 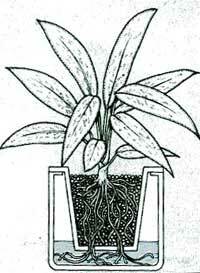 When they have made strong root growth, carefully transfer the pots to their permanent position.